New strategies, equipment, and processes make for improved efficiency and sustainability in the production of perennial grasses. The CenUSA’s Feedstock Logistics team’s objective is to develop innovative systems and strategies for sustainable and economical harvest, transportation, and storage of perennial grasses. These activities can account for half of the production cost of biofuel feedstocks. The team focuses on the development and evaluation of harvest and logistics systems that are easily adaptable, produce consistent and quality feedstock for conversion, and are economically, energetically, and environmentally efficient and sustainable. The team also investigates novel harvest and transport systems, demonstrating these systems at field scale, and evaluating harvest and supply chain costs. It evaluates technologies for more efficient feedstock deconstruction and drying. Switchgrass harvest. Photo: Kevin Shinners, University of Wisconsin. Harvesting switchgrass, with its large, stiff stems, for biofuels requires a different approach than harvesting annual forage grasses. But just like forage, the faster switchgrass or other perennial grasses dry down at harvest, the fewer weather delays and quality losses producers will suffer. To help speed up drydown, the Feedstock Logistics team developed a single-pass, intensive conditioning-tedding process that can reduce switchgrass drying from 3 or 4 days to often less than 2 days. It combines greater stem conditioning than conventional hay equipment can provide, with wide-swath drying that captures a larger fraction of available solar energy. Tedding a switchgrass crop mowed in wide swaths speeds drying. Photo: Kevin Shinners, University of Wisconsin. The tough stems of perennial grasses pose another harvesting problem—they resist compression into conventional bales, which are often much less dense than the 15 lbs. per square foot that meets legal transport weight limits. Denser bales would mean lower costs for aggregation, storage, and, especially, transport for farmers. 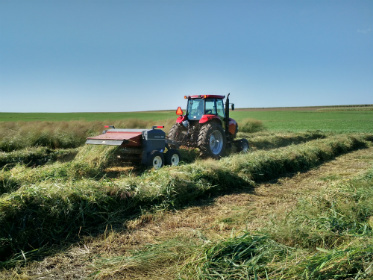 By using a pre-cutter on either large-round or large-square balers, the logistics team was able to increase the density of switchgrass bales by 4 to 6 percent. But where precutting the long, tangled grasses before they went into the baler really paid off was through increased grinding productivity, by 35 to 40%, while reducing the grinding energy requirement by 40 to 45%. These bales handled and stored the same as un-cut bales. Precutting alone did not produce the desired bale density to meet the maximum for weight- and volume-limited transport. The logistics team also evaluated a commercial plungerhead baler that makes high-density large bales specifically to determine how achieving greater density affected specific energy requirements. While this machine achieved the desired bale densities, the fuel requirements increased considerably. Future work for the team is an economic analysis comparing the cost of achieving high density with the potential savings. The Logistics Team evaluated how much energy a commercial, high-density, large-square baler uses when making bales of greater density, critical to efficient transport of bales.Photo: Kevin Shinners, University of Wisconsin. The team also looked at alternative ways to achieve high-density bales without using these conventional plungerhead balers, by designing a bale re-compression press intended to almost double the density of either large-round or large-square bales. Compressing biomass bales in this fashion required only about one-tenth of the fuel needed to produce less-dense bales with plungerhead balers. The Logistics Team designed this recompression press to increase the density of round bales while saving fuel.Photo: Kevin Shinners, University of Wisconsin. The team was the first to quantify the tension of baling twine needed for high-density biomass crops. These bales need stronger twine, but that can cost more than $3 per dry ton, or almost one-quarter of the cost of baling. The team’s work will help baler and twine manufacturers understand how to develop cost-effective solutions to maintaining a high bale density. The team spent plenty of time in the fields but also on their computers, developing models to help producers do a better job of harvesting and storing perennial grass crops. One model predicts the switchgrass drying rate based on weather conditions and configuration of harvest equipment. Another model, of harvest progression, uses the drying rate model to predict the rate and extent of switchgrass harvest across the Upper Midwest. This model will help optimize the harvest fleet size required for a particular size of biorefinery. Just as important as finding improved strategies that work, is discovering what does not. The team researched some harvest and storage methods that turned out to be too expensive or inefficient to recommend or pursue—wrapping bales with protective material, increasing bale size and aggregating bales in different configurations. Researching how switchgrass bales can be transported efficiently and affordably is an important part of the Logistics Team’s efforts. Photo: Kevin Shinners, University of Wisconsin. For producers to be willing to grow switchgrass for a sustainable biofuel industry, they must be able to do so efficiently and profitably. Feedstock logistics, from harvesting through storage and delivery, represents 40 to 50% of the cost of switchgrass production. Anything that can help producers save on those costs will help build production and help the industry to advance. By improving equipment and developing a single-pass, intensive conditioning-tedding process, the team helps producers save time and money by decreasing the amount of days that it takes to dry switchgrass after harvest. 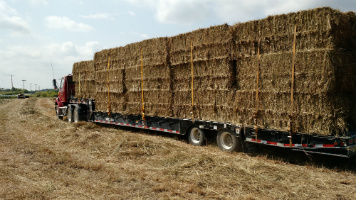 By finding new ways to increase bale density, the team makes storage and transport of switchgrass bales easier and more affordable. By developing new computer models that predict the rate of drying, the team helps farmers better time their harvest. Through models that predict the rate of switchgrass harvest across the Midwest, biorefineries that harvest their own perennial-grass feedstocks can optimize the size of their harvest fleet. By investigating the possibilities for a new, more affordable baler, the team opens the way for better equipment in the future. Logistical Challenges to Switchgrass (Panicum virgatum L.) as a Bioenergy Crop – Amy Kohmetscher; Stuart Birrell. Shinners, K.J. & Friede, J.C. (2013). Improving the drying rate of switchgrass. ASABE Technical Paper No. 1591968. Shinners, K.J. & Friede, J.C. (2013). Energy requirements for at-harvest or on-farm size-reduction of biomass. ASABE Technical Paper No. 1591983. Shinners, K.J. & Friede, J.C., & Kraus, J. & Anstey, D. (2013). Improving bale handling logistics by strategic bale placement. ASABE Technical Paper No. 1591987. 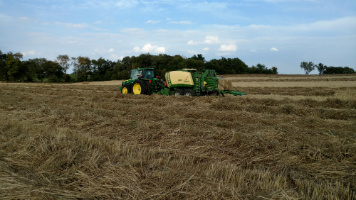 Can I use my regular haying equipment to harvest switchgrass grown for biofuel? How high should I cut switchgrass? I am growing it as a bioenergy crop. 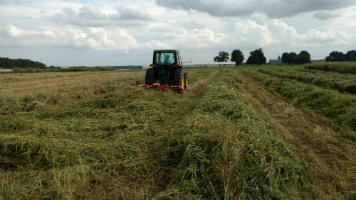 How can I get a switchgrass crop to dry faster in the field once it’s been cut for biomass? How can I reduce dry matter losses to a biomass crop during storage? Williams,S.D. and K.J. Shinners. 2014. Farm-scale anaerobic storage and aerobic stability of high dry matter perennial grasses as biomass feedstock. Biomass & Bioenergy. 64:91-98. Shinners, K.J. G.C. Boettcher, R.E. Muck, P.J. Weimer and M.D. Casler. 2010. Harvest and storage of two perennial grasses as biomass feedstocks. Transactions of the ASABE – 53(2):359-370. 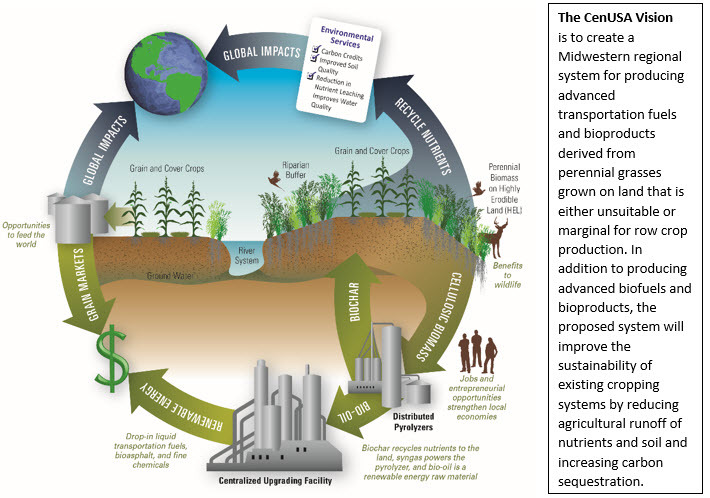 CenUSA Bioenergy is a coordinated research and education effort investigating the creation of a regional system in the Central US for producing advanced transportation fuels from perennial grasses on land that is either unsuitable or marginal for row crop production. * In addition to producing advanced biofuels, the proposed system will improve the sustainability of existing cropping systems by reducing agricultural runoff of nutrients in soil and increasing carbon sequestration.